You are here: Home » Featured » Close Your Eyes! The sky was the prettiest color of blue. The trees were just getting their leaves. Spring had sprung. The traffic was zero. It was just us on the open road. Windows down, breeze in our hair, the smell of freshly cut grass girdled the pick up. 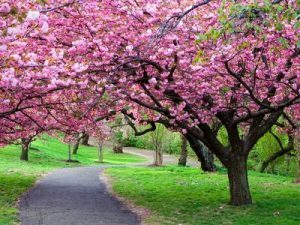 We…(my mom and three daughters) were headed for a short drive to Heber, Utah to enjoy some spring scenery, and to get some ice cream. Everything was absolutely perfect. I closed my eyes, took a deep breath in, and then it happened. (Inset record scratch here) *Clip* *Clip* *Clip* As I opened my eyes and looked over at my Mom, she was doing my #2 pet peeve. Can you guess what it was? Probably. Yep! She was clipping her fingernails……IN MY TRUCK! EW. Gross! I have issues posting this picture. Ew. Why? “MOM! What are you doing?” Her reply was straightforward. “Clipping my nails.” This couldn’t be happening right now. I was in 100% denial. My thought was…who does this? Is this a sick joke? Now…I know I was adopted. “Can you finish that when we get home?” I asked. “I’m almost done.” She replied. What was I supposed to do? She’s my Mom, the one who gave me life. Carried me for nine months, and didn’t kill me when I was a teenager. I counted to 10. Very slowly. When I got to 10, she was done. 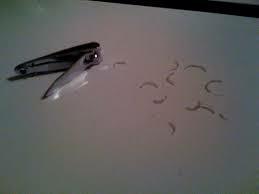 She casually put the clippers back in her purse, and looked out the window like nothing had happened. At this point my brain switched it’s train of thought. How many “clippings” were on the floor? I wonder if some went into my hair? What if they went under the seat, and I’m going to have to pull them out from under the seat one at a time? Or the worse scenario……somehow they are going to regenerate while I’m driving, and we will be killed by an overabundance of nail clippings. I panicked. I had to get to the car wash….STAT! What was I going to tell her? We had just had the truck washed and vacuumed that morning before we left. I know! I can give the baby some crackers, and she could get crumbs on the floor. 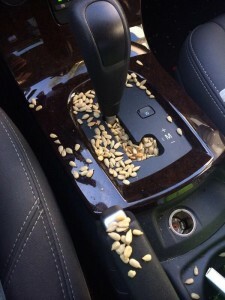 I opened the center console, to realize the only snack that was left in the truck were……sunflower seeds. Perfect! I can accidentally spill some seeds, and have to vacuum them up. BAM! I’m a genius. Little did I know, I grabbed them from the wrong end. I just wanted a few seeds. Not the whole effn bag. The damage was done. Now we really had to go vacuum the truck. To make a seemingly long story short, I got to vacuum….with no questions asked. Yay. ME!